Game Director Benoit Lambert on Batman comparisons, Ubisoft recruitment drives and the Ponte di Rialto. Assassin’s Creed was a frustrating beast, equal parts brilliance and tedium. It loaded our tables with steeples and pennants, astonishingly lifelike NPC throngs and infinitely exploitable parkour playgrounds – but that love of the bigger picture was also its worst enemy, leaving Ubisoft Montreal precious little time and resources to blow on crucial questions of mission structure and variety. The game needed, demanded a sequel, a chance to capitalise on its own ambition. Fortunately, it shifted more than enough copies to warrant one. Benoit Lambert is Game Director on Assassin’s Creed 2, which transits the action from the Crusades era to Renaissance Italy. He was unlucky enough to bump into us at a hotel bar recently. Insolent questions and heated answers after the cut. VideoGameDaily: Have you played Batman: Arkham Asylum? VGD: Did you like it? 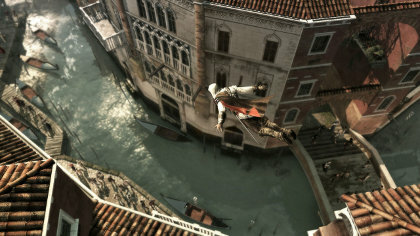 Lambert: Yeah, it’s really nice, really cool – very inspired, I would say, by the controls from Assassin’s Creed 1. This is Ezio, the new hero. Show-off. VGD: That’s interesting. One of the things that struck me about that game is that you don’t need a huge non-linear environment to create a fun, open-ended stealth experience. Did you ever consider narrowing the focus when creating Assassin’s Creed 2? Perhaps setting it within one city rather than spreading it across half a dozen? Lambert: So, you’re saying like, make the game less open? Lambert: But I think criticisms were made of travelling between cities not because it was too much travel, but maybe because you didn’t have much to do. If the world is more full, there are more possibilities, more missions there, you would enjoy travelling. 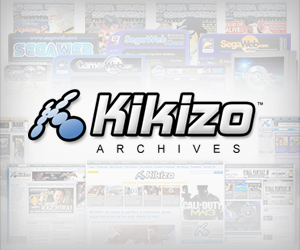 Look at games like World of Warcraft – huge games, and you are travelling a lot, but if there are interesting missions there you will enjoy it. If the landscape is different from one place to another, you will enjoy it. The roof edge takedowns are delightful. 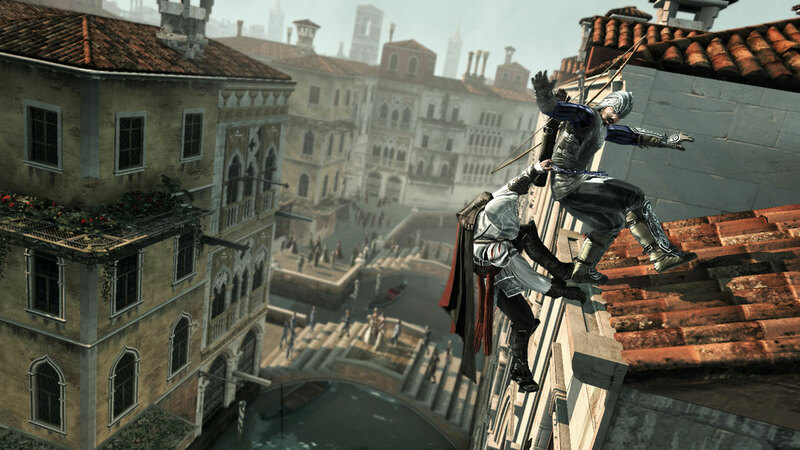 And just to come back to the fact that Batman is more linear, smarter at stealth – Assassin’s Creed is not a stealth game. Assassin’s Creed is an action adventure game where you can fight, do stealth, lots of things – you’re not limited to the stealth aspects. I think games like Thief, for example, are great stealth games but far less linear than Batman. You have a much bigger map, and you enjoy the game more. So I don’t think the size of the world relates to whether it’s a good or bad stealth game. 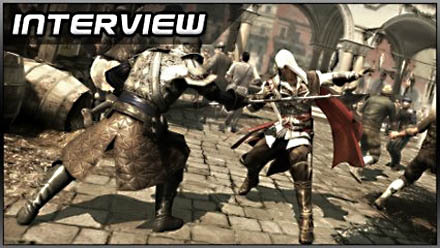 Posted in Interviews, Spotlight, and tagged with Assassin's Creed 2, Benoit Lambert, interview, PlayStation 3, PS3, Ubisoft Montreal, Xbox 360.